How to write a thesis statement and get it right? Knowing how to properly write a thesis statement is crucial to success for writing papers, whether it is a biology essay, college admission paper or composing a proposal for business. The process of writing a thesis statement is identical in any area of writing. The quality of the essay or paper will increase immensely with the right thesis statement. Diction. Simple yet specific words should be chosen for writing a succinct, precise thesis. Start with a general statement that broadly describes the topic and then analyze each part. How can you make it more detailed? What general words can be switched out for words that are more exact? Statements should not be general, and should not be adorned with descriptive words that belong more in creative writing. Structure. The structure of the sentence should be simple yet strong. It should convey its meaning and be specific in what will be covered in the paper. Because the thesis statement forms the foundation of the paper, its primary subject should closely match the topic. Tone. 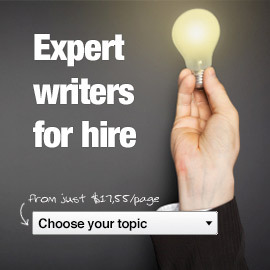 The essay’s main objective is usually to persuade the reader. Whether that means getting approval for a budget, trying to gain scholarship funds or attempting to change the reader’s viewpoint, the proper tone is imperative for this success. The tone should be firm yet empowering, powerful yet confident. The reader should know exactly what the writer’s stance is and how they are going to back up their claim. Placement. Basically, this refers to where in the paper to put the thesis statement. It is common to place the thesis statement as the last sentence in the introduction. This is the perfect place because it lets the reader know what the paragraphs in the body of the essay will be about. Each paragraph should address and support one part of the thesis statement. The summary wraps everything up and offers the reader a conclusion. When the thesis statement is flawless, it increases the power of your paper to make a good impression on the reader. The art of writing a great thesis statement is kind of like learning to ride a bike. Once you master it, you never forget how to do it. It will serve you well in many different kinds of writing that may be required academically or later in a career.